Werewolves, Bullying & Vera Farmiga – Huffington Post! At one point I was obsessed with werewolves. They seemed more reckless and masculine than vampires, the way they burst out of their clothing, muscles bulging (well some of them) running through the countryside facing a bone-white moon. It all thrilled me. Ultimately I channeled that beastly, hyper-masculinity and lyrical violence into my latest novel Three Brothers but I still love a good wolf flick, including MTV’s testosterone-soakedTeen Wolf (my boyfriend’s fave). Most recently, I tumbled across a book trailer for the novel WHEREWOLVES, by John Vamvas and Olga Montes which combines the legendary creature with a high school bullying theme. I caught up with the authors just in time for Halloween and chatted about the book, the subsequent screenplay and their dream cast for a potential film. The book’s basic set up according to the writing team is: A group of high school seniors and their teacher, The Sarge, go on a survival training weekend and must face their biggest enemy: Themselves. A fresh take on bullying told using a fun, rapid-fire style — with edgy, layered characters and plot twists that will keep you guessing. Scott Alexander Hess: What attracted you to the werewolf genre? John Vamvas and Olga Montes: As lifelong horror film fans, we thought our story would best be told through the horror genre. Just like with rollercoasters, horror is popular because of the thrill-the adrenalin rush-you get from being scared. We thought our story would be more interesting were it devilishly fun. We weren’t initially planning on werewolves — they somehow just manifested. Our characters are raw, their emotions visceral, the plot and situations guttural-animalistic. Werewolves can at once be horrifying and beautiful — they’re an incarnation of primal rage, strength and beauty. The beasts presented themselves as we developed the story. Scott Alexander Hess: What is the best werewolf book and film out there (other than yours!)? John Vamvas and Olga Montes: We haven’t read enough werewolf novels to fairly pick one. But we are horror film buffs. Favorite werewolf movie: Though extremely difficult to choose,we’ll go with John Landis’s An American Werewolf in London. There are a lot of great werewolf films, though, (including The Wolf Man (1941 version), Silver Bullet andDog Soldiers) and we pay homage to many of them throughout the story. Scott Alexander Hess: What inspired you to work in the bullying aspect and how does cruelty, pleasure and pain work within the narrative? John Vamvas and Olga Montes: Apparent bullying that lead to the Columbine High School massacre, the Chardon High School massacre and other such atrocities has really marked us –especially now that we have children. We wanted to make a statement and tell a story without giving opinions, only observations. We want the reader to be left with something to think about. We present the reader with parents who serve their country, but at great cost to their children. Teachers who mean well but are riddled with their own monsters. Political events that have skewed our views of the world. Peer pressure, greed, insecurity, desensitization, it goes on. The cruelty in the story is motivated by emotional pain. One character deals with her inner turmoil by taking pleasure in inflicting physical pain upon herself — cutting. Other characters verbally abuse. Some are physically abusive and others think the cruelty is funny; unwittingly adding to the horror. Despite their lack of likability, we hope our characters’ humanity shines through, thus distorting the reader’s concept of good and bad, black and white, right and wrong. Because, what is a monster? Something that grows hair all over and howls? Could be. But the real monster is within, and when it comes out, it’s as ugly as you see it, or as it lets you see it. Scott Alexander Hess: What’s up with the screenplay and any dream casting ideas yet? 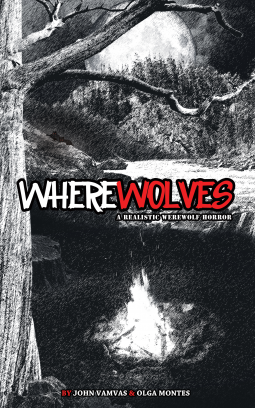 John Vamvas and Olga Montes: WHEREWOLVES had been optioned by a production company in 2010. Though there were a lot of great people involved (including an Academy Award nominated special effects makeup artist), things fell apart in late 2011. The script is now being shopped by our U.S. literary agent, Whitt Brantley, at WBMT, Literary, Film and Television Agency. Our dream cast would include Kiefer Sutherland or Norman Reedus as Sargent Tim O’Sullivan. Taissa Farmiga as the angst-ridden teen, Doris. Vera Farmiga as her mother. And Josh Hutcherson as the tormented Jeffrey.